Brentwood Town make it two preseason victories out of three, with a 2-1 win over a youthful Southend United XI at the Brentwood Arena. The visitors struck first early in the first half through Brandon Scott with a shot from inside the box. Brentwood levelled the match up shortly after as Liam Hope tucked in from close range. 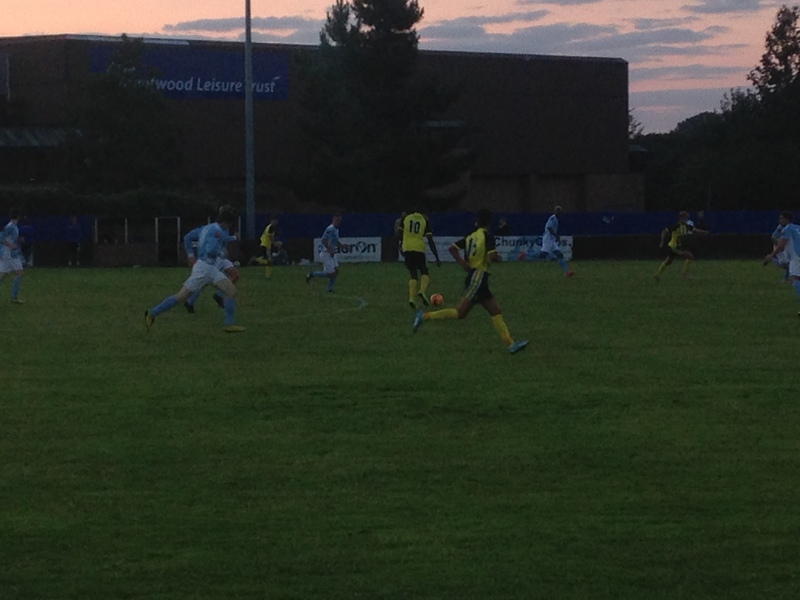 Brentwood took the win late in the second half as debutant substitute Ade Cole was brought down. Shad Ngandu scored from the spot to secure the victory for ‘The Blues’. Southend went infront 18 minutes in after a long range shot was blocked and the ball fell for Scott who bend his shot coolly into the top right corner, with Jack Norton stationary. Brentwood Town equalised five minutes later as a long throw from Mitch Hahn beat the first defender and landed on a plate for an unmarked Hope to tap in from close range, to level. Tom Richardson almost put ‘The Blues’ in front after a lovely long ball by Daryl Robson forced ‘The Shrimpers’ keeper to rush out, Richardson went for the shot out wide but was saved by the feet of Josh Bexon. Another long throw by Hahn was flicked on by Martyn Stokes and nodded in by Robbie Rees, but for the offside flag which denied Brentwood the lead. In the second half a free-kick 20 yards out by Hahn was curled goalwards at the near post which was well-held save by Bexon. Brentwood played with confidence in the second half with long dominated periods of play as Richie Jones slotted a ball to Robbie Rees, he turned just outside the box and his shot was just wide of the target. The home sides’ free flowing play nearly came off with a goal as substitute Shad Ngandu’s lifted ball out wide for Hahn gave him an opportunity to cut inside, as his deflected shot was spilt by Bexon but eventually cleared. ‘The Blues’ side were awarded a penalty with 11 minutes to go as replacement for Rees, Cole was brought down after some quick footwork in the box. Ngandu stepped up and sent Bexon the wrong way to score low into the bottom left, to give Brentwood the lead. Brentwood newbie right back Michael Asombolonga went storming down the right flank with a return inside from Jordan Holdsworth, Asombalonga’s shot and rebound was denied by a superb double save by Bexon to deny Brentwood a third goal. This entry was posted in Football, Sport and tagged Brentwood, Brentwood Town, Dean Holdsworth, Football League, League 1, Phil Brown, Ryman League, Ryman League Premier, Southend United. The Lakeside Vortex Hammers claimed another three home points after a 51-42 win, for their fourth straight home victory against Belle Vue Aces at Arena Essex. Top scorer of the night was Belle Vues’ Matej Zagar with 19+1 with the Hammers top rider captain Andreas Jonsson with 13. Mikkel Bech was away on international duty ahead of the World U21’s Series as Lakeside drafted in a fans favourite former Hammer captain Davey Watt. Number two rider Kim Nilsson remains out injured as former Hammer Piotr Swiderski stepped in. Ashley Birks is out injured for remainder of the season as Ben Morely comes in as the reserve guest. Zagar set his stool out in heat one, gating first and claiming the victory despite Jonsson coming from the back to finish second to level the heat. Heat two was a second split heat with another victory for Belle Vue through Steve Worrell but Adam Ellis and Morely stopped ‘The Aces’ gaining an advantage. The visitors’ stunned Lakeside with an early maximum as Zagar again was electric out the gates and Scott Nicholls supported to take an early 11-7 lead. ‘The Hammers’ responded instantly with a reverse maximum as Ellis made a great start and was aided by Richard Lawson, to level up the meeting. The home side got a slender lead as Swiderski made the bend in front and held off guest Kevin Doolan, as Morely took third. ‘The Aces’ claimed a second maximum as Zagar made his hat-trick of victories and a superb pass by Nicholls in between both Hammers on lap 2 took second, to regain the overall lead at 19-17. Lakeside responded again as Jonsson and Watt got the home sides’ second maximum to regain the lead. ‘The Hammers’ extended their lead to six points after back to back maximums as Lawson won heat eight and Ellis took second. Heat nine was eventful as after the third restart Belle Vue guest Grzegorz Zengota was excluded after falling on the first bend. Swiderski won his second race on the re-start as Ellis supported for their third maximum. Zagar took the tactical ride and won despite Watt’s efforts to shorten the 10 point gap to only five – as the scores stood 34-29. Jonsson secured the race victory after he took the lead during lap two and Swiderski chipped in with a point in third, to maintain their lead. The second reserve race was importantly split as Ellis put in a great ride despite pressure from Worrall who settled for second. Jonsson sped to his third victory and finally got the better of Zagar as he went wide around everyone to lead and hold off Nicholls in second. ‘The Hammers’ secured victory in race 14 with a brilliant ride from Edward Kennett who struggled throughout the evening and was backed-up by Lawson for a fourth maximum. In the nominated heat Zagar ended a very successful night with another victory as Jonsson settled for second and claim a 51-42 victory. This entry was posted in Football, Speedway and tagged Belle Vue Aces, Elite League, Lakeside Hammers, Lakeside Vortex Hammers, Speedway, The Lakeside Vortex Hammers. 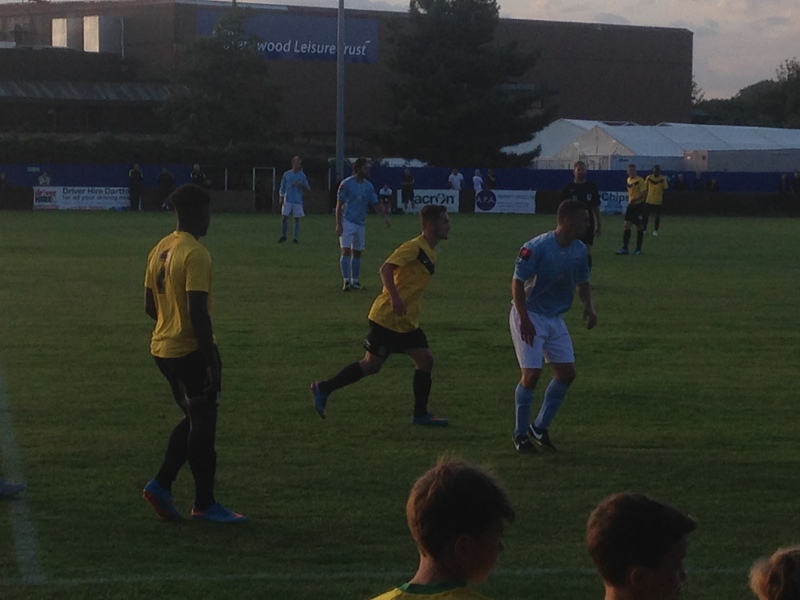 Brentwood Town kicked off their pre-season with a victory under new boss Dean Holdsworth after a 2-0 win over a Dagenham and Redbridge XI at the Brentwood Arena. Two first half goals was the difference for the home side as retainee Robbie Rees scored the opener for ‘The Blues’ from a set piece. New signing Nick Symons who has had a previous spell at the club grabbed the second with a strike just outside the box. New signings that featured in the match was striker Liam Hope from Enfield, Sam Letchmere from local rivals Billericay Town, midfielder Mitch Hahn from Cheshunt and assistant manager Tarkan Mustafa at right back. Brentwood took an early lead 15 minutes in as a free-kick by Rees 30 yards out was whipped in deep and was spilled by the Dagenham keeper Lewis Moore into his own net. ‘The Blues’ continued their lively start as the ball broke to new recruit Hahn whose strike was well saved this time by Moore. 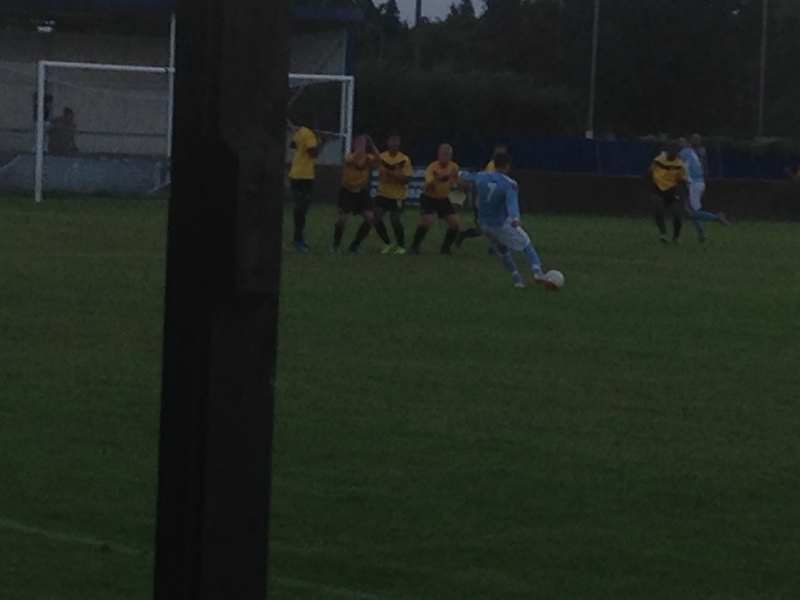 A Throw in by Brentwood was headed goalwards by Captain Martyn Stokes but was parried away for a corner by Moore. The resulting corner was put on a plate for Liam Hope but his header across goal went just wide. 34 minutes in ‘The Daggers’ showed their threat going forward as Reeco Hackett-Fairchild’s header inside the box was straight at the Brentwood keeper Martyn Guest. Goalscorer Rees was substituted 38 minutes in after a knock and was replaced by Jordan Holdsworth. Brentwood doubled their lead 38 minutes in as the ball was half cleared to the edge of the box for new signing Symons to lash his shot, from the edge of the box into the bottom corner. In the second half ‘The Daggers’ made a few changes to their side and as the half went on Brentwood made several changes which impacted on the second half. With 17 minutes to go a corner for Brentwood was headed back into the box by substitute Andrew Freeman and was turned in by Ryan O’Rawe but was ruled out for offside. Symons was awarded Man of the Match as Brentwood now look to their next test before the start of the season Colchester United XI on July 14th. This entry was posted in Football, Sport and tagged Brentwood, Brentwood Town, Dagenham and Redbridge, Dean Holdsworth, Football, Mitch Hahn, Nick Symons, Pre-Season Friendlies, Robbie Rees.